Wouldn't it be great to get off work and come home to a home-cooked meal... made by a robot? Read along to see how Spyce kitchen is going to make that happen. For bumbling chefs there is a growing amount of help and support to get you whipping up a storm in the kitchen. I’ve written previously, for instance, about a new project called Talk to Chef, which aims to put you in touch with an expert who can talk you through the cooking of an exceptional dish via a Skype-like interface. Of course, that still requires you to actually do the cooking, but there are projects that aim to remove even that step from the equation. For instance, a DARPA-backed project tested the use of robots in the kitchen. Researchers were able to train robots a range of cooking skills and maneuvers simply by showing them videos of the activity on YouTube. 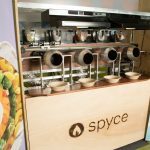 It may sound somewhat far-fetched to ever imagine a kitchen completely staffed by machines, but the Spyce Kitchen is providing a glimpse of just such a future. They have a 20 square foot kitchen that is fully automated. The project, which was a recent winner of the Lemelson-MIT Student Prize, offers a stove, fridge, dishwasher and chef, all in one automated unit. It contains a range of sensors that are capable of ensuring the right ingredients are included in just the right amounts. It can then cook your food at the right temperature, and for the right time, to ensure a beautiful meal comes out the other side. As with most things these days, it has its own app through which diners can order a meal, or, alternatively, dishes can be ordered via a touchscreen interface attached to the device itself. They can even customize each dish by modifying various sauces and spices, before placing all of the ingredients in a dish that is placed inside the machine. The bot then goes to work and the makers claim will produce a tasty dish for you in under five minutes. Suffice to say, it currently isn’t capable of producing any dish you can imagine, but you can get things such as a chickpea curry and a shrimp jambalaya dish. It’s a fascinating approach, and it will be intriguing to see whether it has commercial potential.